Who can get these strays or abandoned dogs/cats off the streets? The stray dog/cat population is actually the responsibility of the City Vet/Pound through the City Health Department. 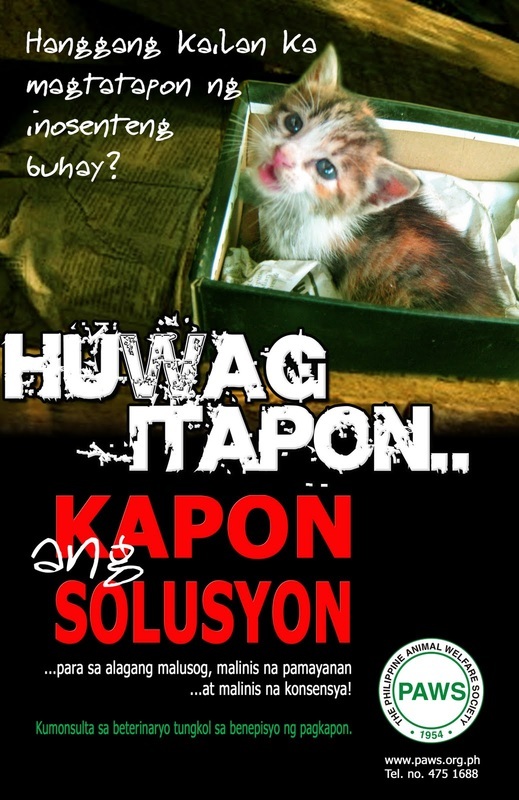 You may report the strays or abandoned animals to them. Under RA9482 The Anti Rabies Act, strays are to be collected humanely by authorized catchers, impounded and euthanized after a certain period (which varies per city: from a few days to a few weeks) if they are not adopted or claimed. Why are they euthanized? ---- This is because your city pound only has space and budget only for X-amount of animals. The quality of care given by the pounds cannot be guaranteed, however, as they may violate The Animal Welfare Act - i.e., dogs may not be fed, may not have proper shelter, and may not be treated humanely. We've received reports about the treatment impounded dogs get but those informants have not been willing to submit their affidavits so that charges may be filed against pound officials. If you have witnessed cruelty and neglect in your city pound, please submit your affidavit - refer to FAQ: Report Animal Cruelty. There is no government agency that "helps animals". With the exception of very few cities, government units just give rabies vaccination programs and catch strays for animal control. IMPORTANT: Learn the difference between ANIMAL CONTROL vs ANIMAL WELFARE. Give a stray dog or cat a second chance at life. Annual vet checkup, routine vaccination, spay/neuter should be a standard (not optional) practice among responsible pet owners and rescuers. Also consider if you have the means to provide medical care in case 1,2 or all of the pets get sick at once.